Prezi is an online presentation tool used in many classrooms, as well as in industry. in a simple, linear, interactive fashion. Click on the image to launch the Prezi. "Opstadology" is the term I coined to pay homage to my Master Teacher, Keith Opstad, who I was blessed to have guide me through his methods for leading students in basic drawing skills. A work-in-progress, this Prezi has the first 17 drawings required to achieve a basic understanding of composition. Each lesson builds upon the previous, to eventually construct relatively complex illustrations. 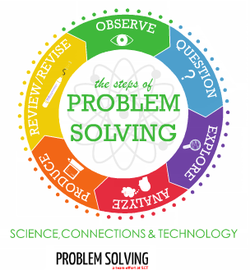 Mrs. Frampton, and her team of teachers from the 2011-2012 school year put this awe-inspiring Prezi together to explain how the problem-solving method is used in a variety of disciplines, including Math, Science, Literature, GIS, History and Graphic Communications.